ThisVoche® 3L Diamond Pattern Stainless Steel Whistling Kettle will add a touch of class to any kitchen. Whistling spout. It is suitable for gas, electric or induction hobs and has easy grip, heat resistant handles. 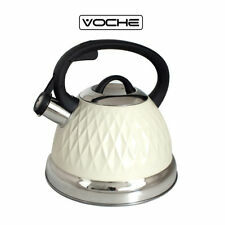 ThisVoche® 3L Diamond Pattern Stainless Steel Whistling Kettle will add a touch of class to any kitchen. Whistling spout. 3 YEAR – for power, air, petrol tools. It is suitable for gas, electric or induction hobs and has easy grip, heat resistant handles. Capacity: 1.7litre (approx. Boil dry protection. It has a non-drip easy pour spout and LED indicator. Colour: Cream. Automatic and manual switch off. Illuminated power on/off switch. BS approved 3 pin UK plug. ). 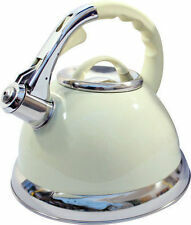 ThisCream 3.5 Litre Capacity Stainless Steel Whistling Kettle will add a touch of class to any kitchen. It is suitable for gas, electric or induction hobs and has an easy grip, heat resistant handle. A stylish and essential addition to any kitchen. The stainless steel Logik L17JBS17 Jug Kettle features a 1.7 litre capacity – so you can boil enough water for most tea runs, or fill a large pan with boiling water in one go for quicker cooking. Easy view water window, so that you can see how much water is in your kettle. Daily Deal. Box Contains. Changed your mind?. Order up to 12pm . Vacuum Cleaners. Exclusion apply. Cord storage, so that your kitchen work top stays neat and tidy. This 1.7L Fast Boil Electric Cordless Pyramid Kettle has a stylish, contemporary design and would look great in any kitchen. Max capacity: 1.7litre. Quest 1.7L Pyramid Kettle Cream. Boil dry protection. Rated Power: 900W. 1.8L Electric Swivel Cordless Kettle & 2 Slice Wide Slot Toaster Set SQ Pyramid . Legacy Kettle. This high quality kettle has been designed by UK based professionals to be as comfortable and user friendly as can be. Application :Induction, Ceramic hobs, Gas cooker, Electric cooker. Traditional kettle shapes have been combined with original colours and modern stainless steel lids. Kettles construction lets for use on every kind of cookers, including induction cooker. This 1.5L Jug Kettle in Cream combines modern design with high performance. 3000W Rapid boil. Cordless design. Colour Cream. Illuminated power switch. Material : Stainless Steel. We will make every attempt possible to resolve the issue if we made a mistake, (It happens). Features include illumination and easy view water window. matching toasters are available matcjing this Morphy Richards kettle, for a fully coordinated look. Easy view water window, so that you can easily view how much water is in your kettle. Klarstein Aquavita Kettle 1.5L 2200w Stainless Steel Cream. 2200W power. Classic kettle in the tea kettle design with 2200W power 1.5 liter cool touch handle. TheKlarstein Aqua Vita is an affable kettle, which competes with a lot of charm to the preparation of hot water for tea, similar infusions and hot dishes. Complete in a traditional design with an attractive stainless steel finish and a removable washable filter, this Brushed Traditional Kettle makes both a stylish and practical boiling solution. Andis Lithium Titanium Foil Cordless Shaver. Kettle with heartwarming tea kettle design. Wireless - kettle removable from station. Cheerful stainless steel kettle with 3000 watts of power, 1.8 litres and heatproof cool-touch handle. 3000 watts of power for rapid heating. The cord storage is great for keeping your worktop tidy and the removable easy-clean filter is perfect for helping maintain the quality and taste of your drinks. It boils quickly too - just the job for when you're having a natter. The1.7 Litre Cream Jug Kettle features acordless design and360 degree base, which has anautomatic cut off technology withstainless steel lid. 1 x Jug Kettle. The revolutionary cordless design allows the kettle to be lifted from its base and a locking lead with a unique trigger button on the rubberized handle to ensure safety and easy fill. This 1.5L Jug Kettle in Cream combines modern design with high performance. 3000W Rapid boil. Cordless design. Colour Cream. Material : Stainless Steel. Illuminated power switch. Automatic Shutoff. MPN : 21888. With a quiet boil feature you will barely notice that the kettle is on, allowing the conversation to continue until the round is ready to be poured. So add a splash of colour to your kitchen counter and invite your family and friends round for a much needed get together! Breville believe that creativity shouldn’t be out of reach and with the right tools anything is possible. Drink, toast, mix, whisk and chop your way to a world of pure imagination. Creative solutions, inspiring ideas. Features | Linsar PK117CREAM 1.7 Litre CREAM Electric Kettle Cordless kettles make life that bit easier – and this model is no exception. Once the water is boiled, you can remove the kettle from the 360-degree base for fuss-free flexibility. This classically designed whistling kettle is given a contemporary look to design your kitchen. Made using quality aluminium, the kettle is suitable for all hobs, except induction, making it ideal for all kitchens. Morphy Richards Cream electric kettle. Well loved. Some rusting of the lid but otherwise in good condition. Collection only please. This 1.5L Jug Kettle in Cream combines modern design with high performance. Breville1.5L Jug Kettle in Cream. 3000W Rapid boil. Cordless design. Colour Cream. Material Stainless Steel. Illuminated power switch. 3.5 Litre Whistling Kettle. Great for camping or in the kitchen on the hob. Whistling spout. Colour: Cream with retro black polka dots. Usable on gas, electric and radient ring hobs. Klarstein Aquavita Breakfast Set Cream | Electric Kettle | Toaster | Cream. Defrosting and warming function as well as bagel function (one-sided toasting). Breakfast set consisting of Aquavita Chalet electric kettle and toaster. This 1.7L Fast Boil Electric Cordless Pyramid Kettle has a stylish, contemporary design and would look great in any kitchen. Max capacity: 1.7litre. Quest 1.7L Pyramid Kettle Red. Boil dry protection. A handy touch-handle will not heat up whilst boiling, allowing you to comfortably and safely use the kettle. 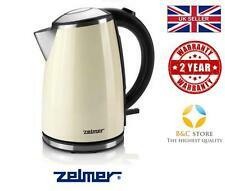 1.8L Cordless Electric Kettle - Cream. 360° Swivel Base: Allows the kettle jug to turn 360°, allowing both right and left handed users to use with ease. Easy view water window, so that you can easily view how much water is in your kettle. 360 degree base, so that you can easily use your kettle whether left or right handed. BrevilleImpressions 1.7L Jug Kettle in Cream. Illuminated switch and blue internal illumination on boil. High gloss plastic with ridge textured finish. Colour Cream. Capacity 1.7L 6-8 cup. Cord storage. This kettle also features an easy-view external water level indicator and an illuminated switch making it a practical addition to any busy kitchen. Sound & Vision. IN ALL CASES, YOUR STATUTORY RIGHTS ARE NOT AFFECTED. Boil dry protection - automatically switches off when the kettle is empty. Pull off lid. EAN: 5011832056726. Boil dry protection - automatically switches off when the kettle is empty. Pull off lid. Rapid boil.